4th October 2015: Handel’s “Orlando” is less frequently performed than his core works but is considered by many to be one of his greatest masterpieces. The title role is one of the finest examples of the parts written for Senesino. In the wrong hands, however, Orlando can be a turgid evening of drama - the recent Covent Garden production is just one example where I found myself praying for a swift conclusion. 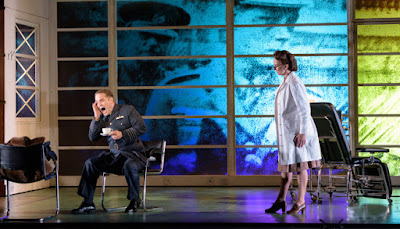 On paper Harry Fehr’s conceit of setting the opera in a hospital for shell shocked servicemen did not sound promising and the reviews from when the production was new at Scottish Opera were not positive. However, for whatever reasons, the production, once transposed to Cardiff struck me as one of the most convincing rethinking of a Handel opera that I have experienced. Every aspect from the simple, elegant designs, excellent lighting and the superbly detailed character direction worked. Much of this must be ascribed to the creative team’s complete trust of the materiel. I have rarely come across a Handel staging which felt so completely unconstrained by the potential straightjacket of the opera seria structure. The wholly naturalistic and convincing acting from all the principals was a tribute to both them and the detailed direction of every scene. Only some clumsy semaphoring from a few of the supernumeraries detracted from the overall success of the evening. All of this would count for nought if WNO had not brought the highest musical standards to the table as well. Fortunately, they engaged the early music specialist Rinaldo Alessandrini who brilliantly conducted a reduced WNO ensemble and elicited a pit sound that was exciting, transparent and wholly free from the sort of po-faced authenticity that can blight performances of Handel. In addition, it would be hard to imagine a better cast fielded anywhere today. Leading the field was Lawrence Zazzo’s astonishing Orlando. Although already familiar with Zazzo from broadcast and recording this was the first time I have experienced him live. He must be optimum casting for this and the other Senesino roles at the moment. Not only is the voice supremely flexible and evenly produced with a complete lack of the dreaded countertenor “hoot” but he has an extraordinary upper range that is both exciting and beautiful. Added to this he is a first rate actor who really uses the music to motivate as opposed to layering his performance on top. Visually he perfectly accords with Fehr’s vision of the pin-up pilot with his tousled blond hair and square-jawed Dan Dare looks. A marvellous performance. Zazzo was lucky to be paired with two first-rate sopranos. 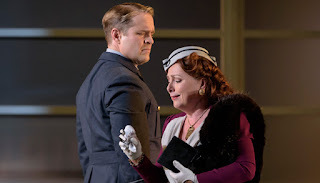 Rebecca Evans Angelica at first came over a shallow and self-centred but, as the evening progressed, her character attained depth and tragic intensity. Her big scenas in Act 2 and 3 were marvels of sustained singing and concentrated emotion. The lighter role of Dorinda was portrayed by the marvellous Fflur Wyn. 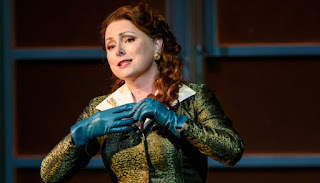 It has been a good year for Wyn: she was an excellent Jemmy in “Guillaume Tell” last year and followed it with highly praised performances of Alice and Lakmé at OHP this summer. Her performance as Dorinda was even stronger combining pearly vocalism with a hugely appealing portrayal of the unlucky-in-love nurse. Someone needs to engage Wyn for Susanna or Zerlina without delay. Robin Blaze was spot on casting as Medoro with both voice and manner providing an apt contrast to Zazzo. I thoroughly enjoyed his slightly shifty, easily led characterisation of the man who is always placed in the reactive position. Inevitably reducing the magician Zoroastro to a slightly unscrupulous doctor weakened an already hazy character. Daniel Grice, who had more than a little of Downton Abbey’s Doctor Clarkson about him, did what he could but occasionally struggled with the unusually wide vocal range. These few cavils apart, this was a really strong evening and eloquently made the case for this wonderful opera.